Flushing, N.Y	- 30 Aug 2017: IBM (NYSE: IBM) today announced it is launching IBM Watson Media, a new suite of AI-powered solutions on the IBM Cloud that analyze images, video, language, sentiment and tone, at the US Open. By combining IBM Watson with IBM’s video capabilities, the United States Tennis Association (USTA) will be able to rapidly share highlight videos of more matches while engaging and informing fans more than ever before. The US Open will use one of the first solutions available through IBM Watson Media called Cognitive Highlights. Developed at IBM Research with IBM iX, Cognitive Highlights can identify the match’s most important moments by analyzing the statistical tennis data, sounds from the crowd and the reactions of a player using both action and facial expression recognition. 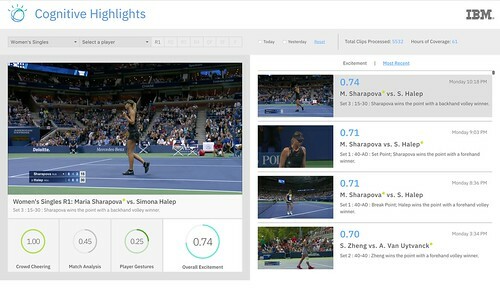 The system then ranks the shots from seven US Open courts and auto-curates the highlights, which simplifies the video production process and ultimately positions the USTA team to scale and accelerate the creation of cognitive highlight packages. Leading up to the US Open, IBM’s cognitive highlights technology was tested as a proof of concept at this year’s Masters Tournament, and also was served as part of the content production system at Wimbledon. The successful results and positive reception at both events led to the technology being integrated into the new soon to be commercially available solutions from IBM Watson Media. Content Search & Discovery: Refined, detailed searches of content down to the scene level based on rich metadata identifying items and context. Recommendation Uplift: More informed suggestions of new content for viewers based on a deeper understanding of video content. Intelligent Closed Captioning: Speech-to-text that can transcribe audio and improve by learning topic-specific terminology. IBM Watson Media is designed to provide companies with a more comprehensive view of video than other technologies on the market. IBM Watson Media will provide a deep analysis of objects, people and words, as well as concepts, emotional overtones and character personalities. This deep understanding of video can help companies deliver more relevant content to consumers, provide advertisers more effective matches for their products and help production teams find specific parts of videos. Available in September through the IBM Cloud on the IBM Marketplace, it will provide a packaged product that can be scaled and used across a company’s video assets. In addition to generating AI-powered match highlights, IBM is elevating the fan experience at the US Open by incorporating a Cognitive Concierge in the US Open app’s Guest Info feature, which will answer a variety of questions from fans attending the tournament. Enabled by Watson APIs, the app will provide information about scoring, schedules, transportation, and dining options featuring a natural language interface – meaning attendees can just type their questions and Watson will respond. Depending on the question, Watson may also plot the response on an interactive map of the venue, which will also indicate an attendee’s current location, where available. This particular application with Watson is also in action as part of IBM’s collaboration with Pebble Beach Resorts in California. In addition, these services are in place at various hotels, retail stores, and banks, as IBM continues to help make physical spaces – in the sports world and beyond – more customizable and responsive to an individual’s needs. SlamTracker is now analyzing player and ball position data, which enables analysis of pace of play and proximity to the baseline, and is now using Watson Machine Learning to train the player style models used as part of the Keys-to-the-Match analysis. IBM Cloud helps the USTA scale up in any or all of the public cloud locations and/or any of the private cloud locations. In addition, due to the multi-active cloud architecture, if an entire cloud location were to be taken off-line for maintenance, the operation of USOpen.org and associated digital platforms would be unaffected. Watson for Cyber Security helps security analysts who protect the U.S. Open digital platforms, providing additional context on threats by mining unstructured data and current security research, drawing from it's learned knowledge base of over 2 million cybersecurity documents. US Open Digital Platforms – IBM designed, developed, and is hosting the US Open’s MobileWeb for iPhone and Android platforms, all of which share scores, highlights, and stories from the tournament.